"Which do you like better, the blue top or the green top?" "Oh, I don't know, Mom," Joy replied. "Can't we just get both?" "Well, you have been growing like a weed lately, and you do need new clothes. So, yes, we can buy both tops today," her mother responded as she placed the items in the shopping cart. "Would you like chocolate or vanilla?" the lady behind the counter asked Joy when they stopped for an ice cream cone. "I just can't decide," Joy answered. "Can I have half chocolate and half vanilla?" The lady behind the counter grinned. "We have a lot of customers like you," she said. "We have a special machine that does just that. Chocolate and vanilla ice cream come out of the machine at the same time and make a swirl." "Then that's what I'll have," Joy answered decisively. Later that day, Joy's mother was getting rather exasperated with her. "Joy, I am not going to buy you two pairs of shoes! You are going to have to decide which you want, or we will go home without the new shoes." Joy just didn't know what to do. Usually she could get by without really making a decision. This time though, she could tell that her mother was growing impatient. "Okay, Mom. I've decided," Joy said in a matter-of-fact manner. "I will buy the sneakers today because I really need them for gym class, and I will come back another day to buy the black shoes." Happy that Joy had finally made a decision, Mother purchased the sneakers and they left the mall. In the car on the way home, Joy's mother had a serious discussion with her daughter. "Some decisions, such as what flavor ice cream you want, are not all that important. It's all right to compromise or not make a decision on something insignificant such as that," Mom, explained. "But there are some decisions which will require a great deal of thought and there can be no compromise." "Well, when you are older, you will have to decide who you are going to marry. That is a decision that will change the course of your whole life." "But that is so far away, Mom," Joy snickered. "I don't need to worry about that for a really long time!" "Yes, that decision can wait quite awhile," her mother agreed. "But what about your decision for Christ? That's a decision that you shouldn't put off too long." "But, Mom, I go to church every Sunday. You and Dad are Christians. Doesn't that make me a Christian, too?" Joy questioned. "No," her mother responded. "We take you to church and try to teach you the right way to live, but that's as much as we can do for you. At some point, you are going to have to decide for yourself whether you are going to follow our ways and follow the Lord, too, or whether you are not going to accept our teachings." Joy thought about that long and hard. "Wow, Mom!" she exclaimed. "That's a really big decision!" "Yes," her mother replied, "but if you make the decision to follow the Lord while you are still young, you will have a whole life ahead of you to live for the Lord, and the Lord will help you make better decisions in the future so you can live without many regrets." "Jacob," Isaac called. "Please come see me. I have something important to discuss with you." 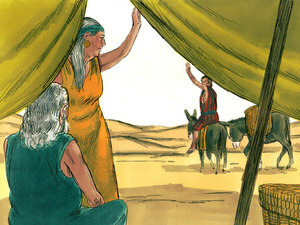 Right away, Jacob went to his father's tent to talk with him. 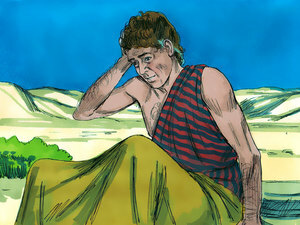 "Jacob, your mother is upset about the women Esau has chosen to be his wives. They worship idols and are ungodly. Your mother doesn't like them at all, and she doesn't want you to marry a woman from this area. We want you to go visit your Uncle Laban in Padan-aram. Perhaps you can find a godly young woman in that area that will become your wife. After all, that is where Eliezer found your mother for me." Knowing that his brother hated him and had already threatened to kill him, Jacob knew he couldn't stay home. He agreed that the plan was a good one. Isaac put his hands on Jacob and prayed for him one last time. "May God Almighty bless you, and give you many descendants, and give you the blessing of Abraham, and may you inherit all the land that God promised to give Abraham." Jacob gave his father and mother a last hug, said good-bye to his family and the servants who had become his friends, and with only a few belongings, climbed on his camel. He left his home in Beersheba and was going toward Haran to visit with his Uncle Laban. He had no idea this would be the last time he would see his beloved mother and father. As the sun was going down and it was beginning to get dark, Jacob decided to stop for the night. "Hmmm. I must have forgotten my pillow," he thought to himself. "I guess I am just going to have to use a rock." Looking around the ground, he found a flat, round stone that he thought would make a perfect pillow. 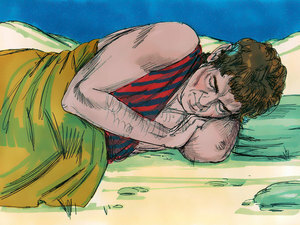 He lay down on the cool ground with the stone under his head, made himself as comfortable as possible, and fell asleep. He must not have had too much trouble falling asleep, because before long, he was dreaming. 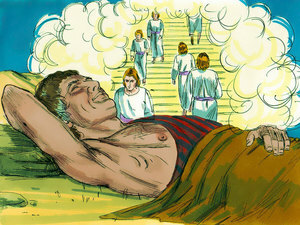 He dreamed of a very tall ladder that started on the earth and reached all the way up into heaven. He saw angels climbing up and down the ladder, and the Lord God stood in heaven above the ladder speaking to him. "I am the Lord God of your grandfather Abraham, and the God of your father Isaac. I am going to give you the land you are lying upon. Your descendants will be as numerous as the dust of the earth. Your people will be spread across the whole world, and all the earth will be blessed because of you. I am with you and will be with you wherever you go, and I will bring you back to this place. I will not leave you, and I will keep my promises." Jacob woke up and realized it was more than just a dream. He realized that the Lord really did talk to him. Jacob had heard stories of how the Lord talked to his grandfather Abraham, and his father Isaac, but this was the first time the Lord had talked to him, and he was afraid. At that moment, Jacob wasn't even sure he was still alive! "That was the Lord, and I must be standing at the gate of heaven!" he said to himself. First Jacob pinched himself. Then he pulled on his beard. Then he got a whiff of his camel. "EEW! That smells worse than Esau's clothes! Yes, I guess I'm still alive and on earth," he said. "Nothing in heaven could possibly smell as bad as that camel!" Having assured himself that he was still alive, he lay back down and tossed and turned. It was impossible to go back to sleep, and since it was still dark and they didn't have flashlights in those days, there was nothing he could do but lie there and think things over. "To think that God would speak to me after all the rotten things I've done!" he thought. "I was a liar and a cheater. I even deceived my own father. I sure am glad that God is gracious and loving and is willing to forgive me for being such a scoundrel. I sure hope someday Esau will forgive me. I'd like to be able to go back home." 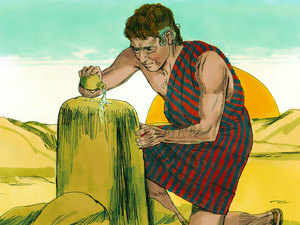 When morning finally came, Jacob took the stone he had been using for a pillow and set it upright, making a pillar (or column) out of it. Then he poured oil on it. 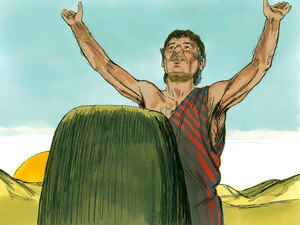 He named the place Bethel, which means House of God, and used the pillar as an altar of prayer. "Lord," he prayed, "if you will truly be with me and will keep me safe in the land where I go, and will give me food to eat and clothing to wear, and bring me back to my father's place in peace; then you will be the Lord my God. This stone which I have set here will be my altar, and I will give you back ten percent of everything that you give me." Even though Jacob had a father, mother, grandfather and grandmother who loved and followed God, he realized he had to make his own decision to follow the Lord. After his prayer of dedication and commitment to God, Jacob got up on his camel and continued his journey to find his Uncle Laban. For what two reasons did Jacob leave home? What did Isaac do for Jacob before he left? What did Jacob do with the rock he had used as a pillow? What name did he give the place where he had the dream? decision to follow the Lord. and will keep thee" (Genesis 28:15a).